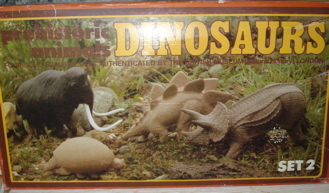 Invicta dinosaurs were the first museum quality dinosaur toys. The INVICTA DINOSAURS gave me quite a surprise. In the Summer of 1979 I was in New York (City) and decided to visit my beloved AMNH (American Museum of Natural History). It was both much as I remembered it and quite different. I had hoped pick up a few SRG figures and my visit to the museum gift shop was both a disappointment (they were long gone) and a very pleasant surprise. There before me was a set of the new British Museum of Natural History Dinosaurs made by Invicta. I took one look and was enthralled. I hadn't purchased a new Dinosaur toy in over a decade (I'd been busy) and here were figures that were highly detailed beyond my experience (which up until then had been limited to SRG and Marx) and (supposedly) all scaled to 1/45. So I purchased a passel of the Invicta Dinosaurs. 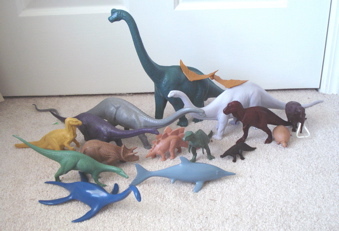 Megalosaurs, Tyrannosaurs, Triceratops, Diplodocus, Stegosaurus, Plesiosaurus and Pteranodon. Even some Blue Whales, Wooly Mammoths and a Scelidosaurus or two. I cleaned them out of Megalosaurus. Beginning in 1974 Invicta Plastics of Leicestershire, England produced this line of twenty-three Dinosaur toys in conjunction with The British Museum of Natural History. First produced in hard, monochromatic rubber (the Blue Whale, Plesiosaurus and Icthyosaurus and Liopleurodon in hard monochrome plastic) the Invicta Dinosaurs series remained in production for twenty years, new releases coming out on a regular basis. In 1988 Safari Ltd. began producing the colorful Carnegie Museum Collection in direct competition with the Invicta line. For some reason the distribution of the Invicta Dinosaurs was quite limited (perhaps an elitist desire to be available only in museum shoppes). In response Invicta Dinosaurs suddenly appeared in new, colorful, painted versions. The hard plastic figures (Icthyosaurus, Plesiosaurus and Pliosaur) now in rubber. They continued this for a while but the figures became harder and harder to find. Today they can still be found on eBay and other web venues as well as your garage sales, flea markets and the like. To learn more about each figure click on the highlighted Dinosaur name. Max Magnus Norman for allowing the use of photos of three of the figures that I no longer or never possessed, the Dimetrodon, Lambeosaurus and Mamenchisaurus. Thanx Max! These were sold both individually and in boxed sets. Box Set 1 (1974) consisted of the Blue Whale, Diplodocus, Megalosaurus and Scelidosaurus. Box Set 2 (1975) was: The Glyptodon, Stegosaurus, Triceratops and Woolly Mammoth. The Invicta Dinosaur series is now Out of Production. I'm about out of bandwidth. There are many other great toy companies that you might want to check out.